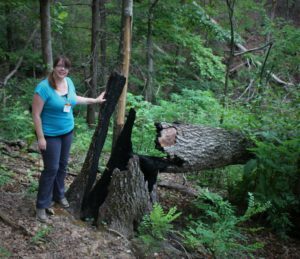 Jessica Metz, teacher at New Kituwah Academy, examines a large burned tree from the 2016 Party Rock Fire during the 2018 Forest to Classroom program. I had a spark of an idea. I wanted to teach about fire. I wanted to teach about the history and culture and science and events of fire that had been in North Carolina from the most ancient of times to current events. But I needed help. I needed information and resources. That’s why I was so excited when I saw it listed on the NC Office of Environmental Education listserv that the focus of this summer’s Forest to Classroom (F2C) workshop would be fire! Having attended previous multi-day intensive programs facilitated by NC State Extension Forestry, I knew this would be a high-quality professional development event. My application was accepted and the spark started to catch! 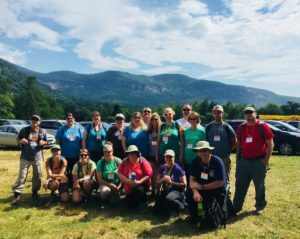 Teachers at the 2018 Forest to Classroom: Fire Focus Program. Behind them is the location of the 2016 Party Rock Fire. What followed was four days of experiential learning with like-minded educators learning from experts in the field. It was absolutely invaluable to be able to connect hands-on experiments with technology and first-person accounts of the many approaches to fire management; from firefighters to scientists to neighbors helping neighbors. Before this experience, I truly never thought of how many different organizations have to constantly and effectively communicate in order to monitor the many aspects of both wildfires and prescribed burns. When I thought of teaching about fire, I thought I would basically be teaching forest ecology. Now I see that teaching and learning about forest fires is so much more! It is teaching weather, and chemistry, and physics, and government, and ecology, and responsibility, and citizenship. My spark of an idea was becoming a full-on blaze. Rutherford County Ranger, Doug Thompson, introduced teachers to the wide variety of tools used in the field for wild and prescribed fires during the 2018 Forest to Classroom program. As the summer is wrapping up, I am looking forward to getting back to school and using much of what I learned during the fire-focused Forest to Classroom event to create a project based learning plan for my fifth-grade class. Many of the activities I have planned to inspire and engage students during the project come directly from activities and resources I learned during F2C. We will use the Firewise checklist to begin our project. We will have a panel discussion of fire professionals and policymakers. We will have Cherokee tribal elders tell us the history and folklore of fire. We will research recent local fire events and predict upcoming events using the variety of technology resources I learned. The students will even do an abbreviated version of the Work Capacity Test to see if they are red card ready! And of course, this will all take place during forest fire season in October and November. This learning fire can’t be contained! I am so thankful to have been chosen to be a part of this amazing experience and can’t wait to share all I learned with students and educators going forward! Thank you to Jessica Metz, a 3rd-6th grade teacher at New Kituwah Academy in Cherokee, North Carolina, for sharing her F2C story with us! 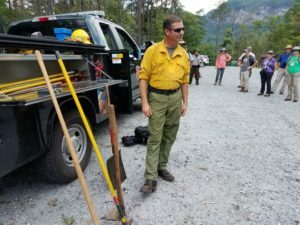 She was one of 16 North Carolina teachers to join Extension Forestry and the North Carolina Forest Service for the fire-focused program held at the end of June and based in Edneyville, North Carolina. We would like to thank all the site hosts and speakers that made this event possible. The 2018 Forest to Classroom program was sponsored by NC State University Extension Forestry, the North Carolina Forest Service, USDA Renewable Resource Extension Act, Appalachian RC&D FAC Coalition, NC Prescribed Fire Council, and Chimney Rock Management Company. The program facilitators were Renee Strnad and Laurel Kays with NC State Extension Forestry, as well as Hannah Thompson Welch and Justin Query with the NC Forest Service.